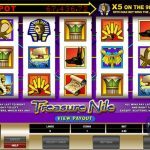 Treasure Nile is an Egyptian themed online slot from Microgaming. There is an interesting fact behind this game, namely the grand prize is paid every 20 to 25 days in average. This makes this game one of the most profitable ones. The game is perfectly crafted and we can see that they paid attention to every detail here. Egyptian atmosphere is brought by theme related symbols like King Tut, hieroglyph scrolls and jewelry just to name some. 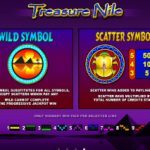 Treasure Nile does not offer a lot of excitement when it comes to special features, beside the fact that it offers a progressive jackpot. The wild symbol is the pyramid and it is true that it completes a winning line by substituting every symbol but the scatter and King Tut, but it does not offer a multiplier. The scatter symbol does not activate any special features it only offers scatter payouts. 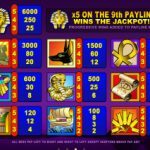 You will win the progressive jackpot if you land 5 King Tut’s symbols on the 9th pay line. The good thing here is that the jackpot always starts at $40.000 and since it is progressive that amount constantly increases. So, this is a good amount to start with. Microgaming created Treasure Nile the way it is with a single idea in mind, to focus on the jackpot. You cannot get played here, you either win the big prize or not. Many would say that lack of special features is a big down fall in this game but we cannot agree with that statement. Treasure Nile is an interesting game that has lots to offer and if you have not tried it yet than we highly advise you to do so. Not enough ancient Egypt? Then you should consider playing Mega Moolah Isis a 5 reel slot by MicroGaming.